Fake fraudster Benny Hinn is at it again – the same guy who predicted the end of the world in 1992 and 1999, as well as the death of Fidel Castro in the 90’s – is now back on the road putting on more of his scandalously fake shows. 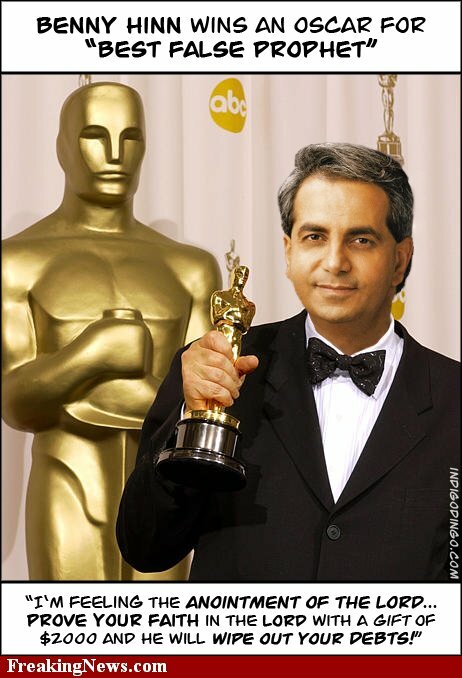 Benny Hinn is a megachurch televangelist “faith healer”. He claims to have been blessed directly by God himself with “The Anointing” that enables him to carry out supernatural acts. He also claims that he does this for the love of people and not the money (although he has been able to make $42 million dollars scamming people with his “anointings”. Basically Benny Hinn preys upon gullible people who have serious illnesses or have loved ones with serious illnesses such as AIDS, cancer, blindness and deafness and claims to be able to cure them. However there have been many deep investigative reports on his so-called healings and not one investigation was able to find any evidence of healings. These investigative reports were done by reputable organizations such as the Los Angeles Times, Dateline, HBO, 60 Minutes, and others. 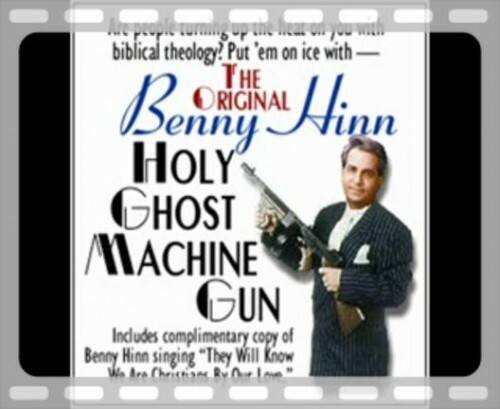 How does anyone believe in Benny Hinn the fake fraudster?!?! In 1999 he appeared on TBN and claimed that God had given him a vision telling him he would resurrect THOUSANDS of the dead… basically that people who placed their dead loved ones hands on TV screens tuned to the station would see them come back to life. I am sure this lead to the horrifically macabre scenario of many gullible people placing dear departed mums hands on the tv… while the corpse slouched over. How else does Benny Hinn do God’s work? 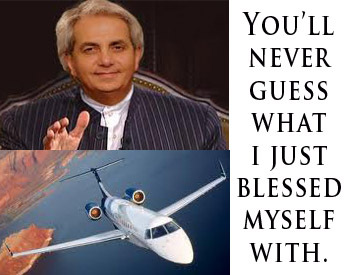 In 2006 Benny Hinn Ministries decided that Benny Hinn was in need of a Gulfstream G4SP jet and sent out an email asking for donations to buy one. Benny Hinn Ministries purchased this jet in 2007 for $36,000,000 and it costs $600,000 per year to maintain. I’m sure that this is a much better investment for Christians than donating that $36 million to the poor and truly sick and needy. Benny Hinn Ministeries has also been issued a “Donor Alert” by Ministry Watch – a nonprofit group that monitors religious groups for scams and frauds. Benny Hinn also violated scripture by divorcing his wife Suzanne in a major scandal. He claimed she was addicted to prescription drugs – wouldn’t you be addicted to prescription drugs if you were married to a psychopath who stole millions of dollars from gullible people? If you visit Benny Hinn’s site it is currently geared towards taking money from people either by selling books and videos or directly accepting donations or getting people to come to his fraudulent miracle healing services. He has over 80 books for sale on the site, most for ridiculous prices like $100. I am willing to bet the value of one of his books ($100!) that most if not all of these books were ghost written. Benny Hinn just rakes in the cash off of them. Horrible financial advice by Benny Hinn – Benny Hinn recommends that you make more money by donating $2,000 to him. Apparently god will bless you if you give Hinn donations. He misquotes a bunch of Bible verses written at other groups of people in order to try to back up his assertions that donating money to Benny Hinn and his quest for ever more awesome jets will result in you becoming rich. Next Next post: Coalition Basketball Wins!